Visual Pinball X trae muchas mejoras que no puedes dejar pasar, para quienes no tenían ya instalado Visual Pinball no existe ningún motivo para que a la hora de hacer la instalación no lo hagan ya con esta nueva versión ya que además, podrán añadir mesas de otras versiones. Entre quienes ya tienen Visual Pinball 9 ya instalado y configurado, existe un gran temor a que algo salga mal y tengan que configurarlo todo de nuevo, desde aquí les puedo decir que no sólo no van a tener problemas, si no que lo más probable es que solucionen problemas existentes. Unos por hacer una nueva instalación y otros por usar VPLauncher. VPLauncher es un script de AutoHotkey que le va a decir a PinballX con que versión debe abrir cada mesa, lo cual nos permitirá tener mesas de varias versiones. Por ejemplo Monster Bash, me funcionaba correctamente abriéndola con doble clic ya que la abría con VPinball992.exe, pero PinballX la abría con Vpinball921.exe, lo cual provocaba fallos de funcionamiento. El Script no está programado por mi, encontré la información en VPForums y le he hecho algún retoque para que coincidan los nombres con los de la instalación de VPX. VPLancher tienes que ponerlo en tu carpeta Visual Pinball, junto con todos los .exe de Visual Pinball. Veras que hay dos ejecutables en la descarga, VPLauncher.exe y VPLauncher32Bit.exe, si usas un sistema operativo de 32 Bits, deberás usar el de 32 Bits o no te abrirá las mesas. Yo solo recomiendo un sistema de 32 bits si vas a jugar en modo escritorio (1 pantalla) ya que un sistema de 32 bits no de reconocerá más de 3Gb de RAM y para jugar en modo cabinet (2 o 3 pantallas) es recomendable como mínimo 4Gb de RAM y un procesador de cuatro núcleos. Table = %2% ;Variable from PinballX or batch file personal use. Pués ese Script, entre otras cosas, lo que está haciendo es, basándose en parte del texto, ejecutar la mesa en la versión que corresponda. Todas las mesas de VPX las va a ejecutar con VPinballX.exe ya que todas contienen .vpx en su extensión. La mesas de Monster Bash, para que me la ejecute correctamente la he renombrado a VP92_Monster…. Y cuando no encuentra una descripción coincidente, lo hará con VPinball921.exe, con lo cual, solo tenemos que renombrar las mesas que nos den problemas con la versión 921, aunque si quieres renombrarlas todas tampoco sería un problema. ¿QUE HAY QUE CAMBIAR EN PINBALLX? 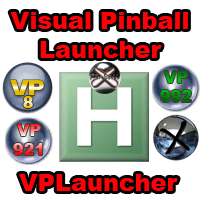 En PinballX, en la configuración de Visual Pinball, tan solo tienes que cambiar el ejecutable, VPinball921.exe por VPLauncher.exe (64Bits) o VPLauncher32Bit.exe (32Bits), todos los demás parámetros se mantienen. (Si es tu primera instalación, visita el manual de PinballX). Nada más. simplemente comentar que si necesitas editar el Script, necesitas el programa gratuito AutoHotkey, que puedes bajar de su web: https://autohotkey.com/ sólo si necesitas editarlo, del enlace de descarga ya lo tienes como ejecutable para que funcione en cualquier equipo. Tan solo tienes que descomprimir, meter el VPLauncher.exe en tu carpeta Visual Pinball y hacer lo que hemos comentado en este tema. It's a simple app to build ROM repositories off your GameEx favorites list. You can also build a repo of games you've played. Point the app at GameEx.exe and select the emulator. Next, set your source and destination folders. Hit "go". Done. You can also hit "stop" if you don't wanna wait anymore and it'll stop. GameEx ROM path support Generate miss lists if you're missing ROMs MAME *.zip and *.7z support Build ROM sets off your favorites or previously played ROMs Questions or comments? I created this program to force GameEx to be the top most program, above HideOS. Sometimes HideOS would become the topmost program and GameEx would become hidden. This program solves that problem. Just add this program to be launched by GameEx after it starts. Thanks for trying out the program, hope it works for you. Brien L. Johnson, president of XHP Creations. I created this program to easily change your Windows Shell to GameEx, or any other program you choose, and it will also re-enable the Windows Shell (or other Shell you choose) temporarily, so you can reload Windows instantly and reset the shell to the previous state after loading Windows. I have GameEx as my Windows Shell right now, but it was not very easy to exit GameEx and access Windows if I needed to, and so this program was made to do everything automatically for me. You set the program to launch in the "Launch On Exit" setting in the "Tweaks/Performance" settings of GameEx. The "Shell To Start" is the shell you want to temporarily start. I suppose you could start another shell besides the Windows explorer shell, but this is what I use it for. The "Shell To Use" is the shell you want to become active after you reboot the computer. The program can set this value without actually starting a new shell by clicking the "Only Set As New Shell" button. This is the button you can use to set the shell to GameEx the first time. If you click the Submit button, then the temporary shell will start, and the new shell will be set. If you click the Exit without Submitting Changes button, then nothing will happen. This has only been tested in Windows7, but should work in Vista or XP. I have no idea how it would work in Windows 8. It's an application to browse, download, and install all of my plugins using one handy interface. All you need is GameEx and an internet connection. I plan for this to support all plugins, not just mine... but for the time being no one else has made one, so it's all DracLabs content... Hopefully one day that will change. Launch the EXE. 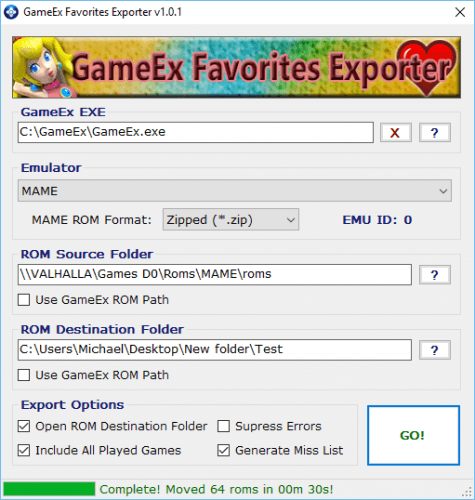 Browse to the GameEx executable using the [...] button. Select the plugin you wish to install from the drop down list, click the button, and viola! You did it! There's a news blotter at the top so you can always stay up on the latest releases. Where is the forum post for this? here. Thank you for your support!